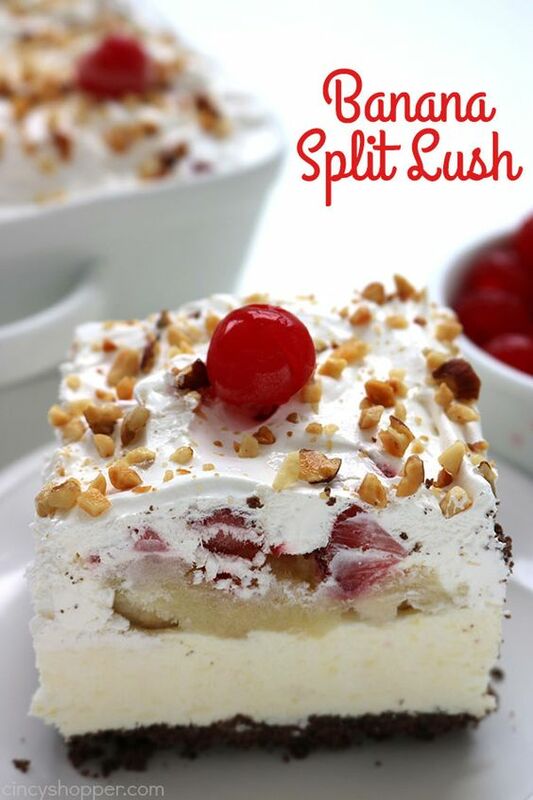 his Banana Split Lush Dessert has all the flavors of a delicious banana split and is no bake. Perfect for serving a crowd at your summer picnics and bbq’s. Banana Split Lush I am a HUGE fan of banana splits. This super simple dessert combines banana, pineapple, strawberry, and chocolate. So totally yummy. am a HUGE fan of banana splits. This super simple dessert combines banana, pineapple, strawberry, and chocolate. So totally yummy. Summertime is always about all the fun cold treat desserts. I have shared so many ice cream and refreshing cold treats here on my blog. I also shared my yummy Banana Split Bites over on my small blog OurFamilyofSeven. Blend melted butter, graham crackers and sugar together and press into bottom of a 9x13 baking dish. Whisk together pudding mix and milk until it starts to thicken. Add cream cheese to pudding mixture and beat until well blended. Fold in 8 oz Cool Whip. Spread mixture over graham cracker crust and return to freezer for 15 minutes. Add rows of sliced bananas, crushed pineapple and diced strawberries over cream cheese mixture. Top with remaining 8 oz of Cool Whip. Garnish with crush peanuts and cherries and refrigerate until ready to serve.